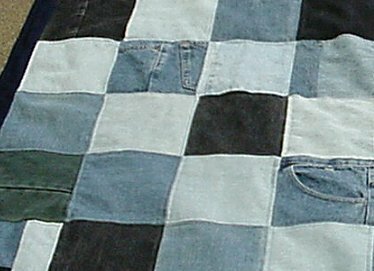 I made my first denim quilt about 5 years ago for my youngest son. When I recently came across this site, I was re-inspired to make another. I enjoyed seeing all the wonderful quilts and have so many ideas of quilts to come. Notice in the detail below how Deena used the pockets and seams in some of the blocks. This is one of two quilts I made for my teenage sons. They are both the same format. This was made from their blue (and black) jeans that I have been saving and cutting for a few years. Those "growing" years. I cut 6 1/2" squares from different areas of the pants. I sewed the blocks together with 1/4" seam allowance. The backing is camouflage polar fleece. Perfect for boys. This quilt is the width of the fleece. I then machine quilted 1/4" on each side of the seam. The border and binding is from bought denim. 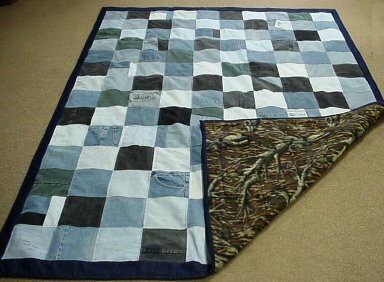 This quilt is a twin size, the very first one was smaller than twin, and works well in the car and at sporting events. My oldest son is a senior going to college in the fall. I am so glad to give him something so useful and hopefully something so comforting. Both of my sons love their new quilts, and two of my nephews have put requests in one. Thank you for posting such a great place for quilters to enjoy quilts.